for $226,000 with 3 bedrooms and 2 full baths. This 2,071 square foot home was built in 1979 on a lot size of 160x120. 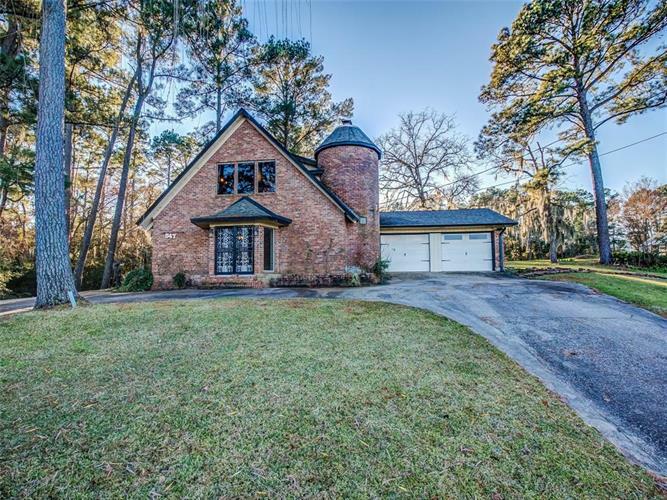 Beautiful brick "castle" home, high on the hill overlooking Lake Livingston. The second landscaped lot tiers gently down with even more great views. This 3 bedroom, 2 bath home is unique in design with very high vaulted ceiling and windows and a huge wood burning fireplace wall in living room. Two steps up is the dining room with a curved bay window that views a unique garden setting. Kitchen has lots of storage, new counters and is open to the dining room. All the floors are real tile; loft and bedrooms are carpeted. Another special feature is the tower housing winding brick staircase to the second floor. A large open loft area has views out to the lake. There is an exit door and exterior staircase down to the yard from this upper level. Two bedrooms and a full bath complete the 2nd floor. A large attached 2 car garage has storage space and the laundry area.